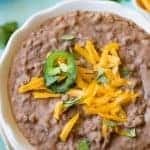 Homemade Refried Beans! Quick and easy! Only 2 ingredients. These are the perfect side dish to any mexican meal, or any meal. Sort through the beans to ensure that they are good. Add the beans and the minced garlic to a large pot or pan. Pour the water in. Beans should be fully submerged in water. Bring to a boil, then turn the heat to low and continue to simmer covered. Allow to cook for about 1 and 1/2 hours, stirring every half hour, until beans are soft. Once the beans are soft, remove the lid and continue to cook uncovered until all water is absorbed. Mash the beans to desired consistency and add salt. If beans are not as soft as desired add more water! Stir to combine.